I know, I'm a terrible blogger. I'm not sure how and what to blog, and somehow that's when I hardly blog at all. But I figured I might as well give you some sewing updates. Yes, you've seen a bag like this before, but this time I tried to center the print. The asymetric look of the other one bothered me (perfectionist, who me?). I really like how this turned out. And I tried a different pattern. Simple but elegant. A request from my father, to carry his papers. Recycling. 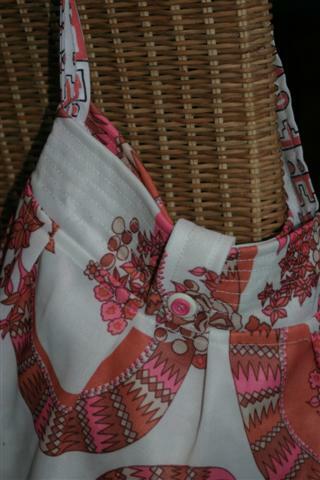 Used to be an old polyester (so, not really wearable) blouse, now a cute little bag.